Hearts' Don Cowie wants to play in more derby matches. Picture: SNS. Don Cowie says that the lure of Edinburgh derbies played a part in him signing for Hearts this season and has admitted that he would like to see the Leith club safely navigate the play-offs and return to the top flight so he can indulge in the fixture again next term. “It’s no disrespect to anyone else in the play-offs, but we want Hibs in the league,” said the 33-year-old, echoing the sentiments expressed by owner Ann Budge this week. 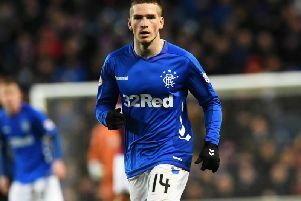 The midfielder, who will spend some of his summer adding to his coaching qualifications and is relishing the chance to sample European football for the first time in his career when the new season starts, made his debut against Hibs. He thought he knew what to expect, the reality was more thrilling, even if the cup tie ultimately did not go the Gorgie club’s way. With or without Hibs, next term already promises the mouthwatering prospect of Europa League qualifiers and the return of Rangers to the Premiership, while champions-elect Celtic will also have a new manager at the helm.Cowie’s former boss Malky Mackay is one of those being linked with the job. “Three times I ended up working with him [at Watford, Cardiff and Wigan]. He’s a very detailed manager. He really plans ahead and gets a team working hard for the badge. He’s about commitment and has a good man-management style. He obviously has that affinity with Celtic and it’s only natural that he is getting linked with it. He had a very successful spell.